1. Your sibling borrows your coat jacket for a backpacking trip in the Colorado Rockies and loses it. He later asks for forgiveness face-to-face and buys a new jacket and a 12 pack of Coca-Cola. 2. A close family member forgets to call you on your birthday and doesn’t even send you a message on Facebook. 3. Your best friend gets shot and murdered by a robber. 4. Someone cuts you off at an intersection, cusses you out, and says it’s your entire fault even though he was speeding through the traffic light. 5. You find out that your spouse or fiancée is cheating on you. What does it mean to forgive? Forgiveness is an intentional, voluntary change in feelings regarding an offense, with an increased ability to wish the offender well. Is forgiveness the same thing as excusing or forgetting the offense? What if the person never apologizes for the offense? Do you still have to forgive him or her? Jesus helps clarify how believers are to forgive others. He told his disciples, “love your enemies and pray for those who persecute you (Matt. 5:44).” When Peter asked Jesus, “How often are we to forgive, up to seven times?” Jesus responded, “Not 7, but 7 times 77.” Jesus’ comment isn’t to be taken literally, but is a figurative statement meaning forgive no matter what. Jesus then tells a story about a moneylender who had two debtors. One owed 20 months worth of wages and the other owed about two months’ wages. When both of them could not pay, the moneylender cancelled the debt of both. Jesus asked one of the Pharisees, “Which of them will love more?” Simon answered, “The one for whom he cancelled the larger debt.” Jesus agrees and demonstrates how the sinful woman reflected the beauty of forgiveness. Though she had many sins, her forgiveness was much greater than the Pharisees. This was evident by the way she approached Jesus, showing humility with her tears and hospitality by anointing his feet. All of us have a debt to be paid and need forgiveness. No matter how small or great our sins are, God is willing to forgive. 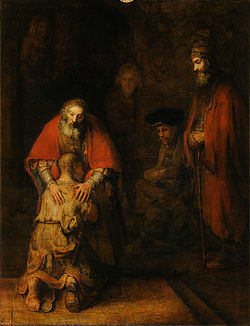 In Acts 13:38, the apostles state: “I want you to know that through Jesus the forgiveness of sins is proclaimed to you.” This is the greatest news ever told. If you are in need of forgiveness, call out to God. He is our High Priest, prepared to forgive you and cleanse you from all unrighteousness. Don’t miss the opportunity. Do it today. Really good article. In recent years I’ve had to learn better how to forgive. Also, I enjoyed your writing. You appear to be a really good communicator of scriptural truth; and I’m glad to be following. Cheers. Hey Michael, thanks for the encouragement. You are a good communicator too. Keep sharing the good news with others on your website. God bless!